Don't miss the latest headlines. Sign up for our Daily Digests. Two dangerous warning signs occurred separately a few years ago to remind staff at the University of Minnesota that the sprawling campus needed a new source of heating and electricity. 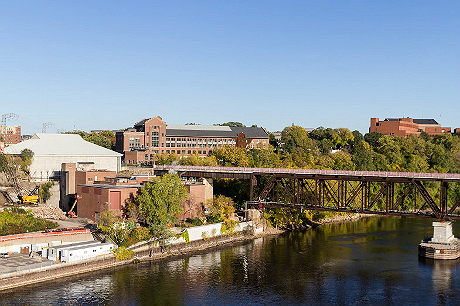 The University’s main campus, along the banks of the Mississippi River in Minneapolis, is largely heated by the Southeast Steam Plant, a 1903 facility located upriver from the campus. Jerome Malmquist, the university’s director of energy management, says a major crisis was narrowly averted when a freeway bridge between the steam plant and the main campus suddenly collapsed in 2007. Fortunately, underground steam tunnel beneath the freeway bridge was undamaged. But around the same time, two boilers went offline on a particularly cold day, an episode that sent shivers up the spine of Malmquist and his staff that had nothing to do with the weather. Construction is will soon begin on a $96 million combined heat and power (CHP) plant in another aging facility near the river’s edge that will dramatically cut the campus’ carbon footprint while driving down the cost of energy, he said. The project, in the 1912-vintage Old Main Utility Building, will produce enough steam to heat the entire campus and meet about half of its electricity demand. CHP will be a major tactic in the goal of reducing the University’s carbon emissions by 50 percent by 2020, said Shane Stennes, who serves as the University Services’ sustainability coordinator. The Southeast Steam Plant, itself a CHP facility, mainly used natural gas but still had a small measure of coal in its fuel mix, along with oat hulls. “The carbon reduction is partly due to a change in fuel but mostly a result of increased efficiency,” Stennes said. The ability to use the waste heat from the electricity generation process is the real reason the University will see carbon emissions plummet, he added. “From the sustainability point of view this plant is the right thing to do,” he said, noting that in 2008 the University’s campus system agreed to a net zero scenario in the American College and University Presidents’ Climate Commitment. CHP is on a bit of a roll. President Barack Obama signed an executive order in 2012 promoting wider adoption of CHP and the state Department of Commerce recently held stakeholders’ meetings on the issue to determine how the state might help in moving forward projects. The university’s project makes sense because the campus is so large and the ability to procure low-cost financing is significantly easier, said Michael Burr, director of the Microgrid Institute. Many large universities and federal government agencies, such as the Food & Drug Administration, are using CHP to save money and because it provides a level of resiliency not available if their buildings were connected to the electric grid. Minnesota has at latest count 55 CHP systems in the state, according to the ICF International. A campus CHP comes with another advantage by creating an “island” of energy independence should a regional blackout hit. Many major Midwest and coastal universities have CHP in part to rely less on power grids that are vulnerable to major storms or other weather maladies, he said. “We see CHP as a way to be competitive with other schools and to protect research if we had a catastrophe,” he said. The need for more boilers, said Malmquist, stems from growing demand for power. Although the nearly dozen new buildings constructed in the last few years meet rigorous energy efficiency standards they tend to demand more power due to their function as research centers. The Biomedical Discovery District, a new physics laboratory, technology classroom and other science-related buildings, as well as a new residence hall, have added square footage for steam and electricity, he said. “The buildings we’re putting up today are more energy intensive than the ones we’ve been taking down,” said Malmquist. The university initially saw the addition of new boilers as a peaking plant to manage heating demands in winter. After studying the “sparks spread” — basically the price charged for energy compared with cost of producing that energy onsite — CHP compared well, especially when considering conventional generation. In addition, the university’s bill from Xcel Energy will be about half it was prior to the new CHP. The university’s Board of Regents approved the project based on “a complex spreadsheet” showing CHP’s superior efficiency and output, Stennes said. The Southeast plant, itself a CHP, will remain part of the mix, but more as a backup steam source rather than the preferred one. Two aging 60-year-old coal-fired boilers will be retired at Southeast before Old Main takes over in 2016. When judging whether CHP is actually beneficial to the environment, the power source comes into play, said Will Nissen, a Fresh Energy senior policy associate who attended the Commerce stakeholder meetings. CHP can be renewable, he explained, and does offer more efficient generation than a traditional power plant. “It works well in the right scenario and the right fuel source,” he said, noting that natural gas or biomass would be preferable to coal generation in every situation. Part of the expense in the university’s project is not just the equipment but fixing up a mothballed building that requires extensive pollution abatement on the interior to rid it of lead, asbestos and mercury, Stennes said. The building had been decommissioned and left vacant for several years, he added. While the University had to “go big” to make CHP work, Malmquist has seen it scale down to even neighborhood size in Canada and Sweden. Recently, he viewed near Toronto a CHP project serving several buildings totaling just one million square feet, smaller than many corporate campuses in the Twin Cities. Looking at the metropolitan region and in particular the Ford Plant site in St. Paul, he sees potential for CHP in mixed use developments. “When you talk about distributed energy generation in this country and the need to use as much of the BTU before you lose it combined heat and power can make sense,” he said. Editor’s note – an earlier version of this story misstated the University of Minnesota’s climate goals. They are a 50 percent reduction in emissions by 2020, and carbon neutrality by 2050. Fresh Energy is a member of RE-AMP, which publishes Midwest Energy News, and is also where the publication is based. Frank is an independent journalist and consultant based in St. Paul and a longtime contributor to Midwest Energy News. His articles have appeared in more than 50 publications, including Minnesota Monthly, Wired, The Los Angeles Times, The Star Tribune, Minnesota Technology, Finance & Commerce and others. Frank has also been a Humphrey Policy Fellow at the University of Minnesota, a Fulbright journalism teacher in Pakistan and Albania, and was also program director of the World Press Institute at Macalester College. Minnesota takes the lead with reforms advocates say will bolster the case for combined heat and power plants. One of the most progressive measures in a bill to modernize Virginia’s grid relies on some of the oldest electrical technology around – harkening back to Thomas Edison’s very first power plant. Acknowledging that a new fossil-fuel powered plant may have little environmental upside, Duke University officials say they are not committed to the $55 million project they announced in May, even if state regulators give it the green light. Would Duke Energy’s $76 million electric vehicle plan leave room for competition?